The 30' power cord and extra large water tank allow you to clean more and clean fast. 2 Mop Heads in different shapes and sizes, insure an easy accessible clean for all spaces. Rectangle, and large open-area mop head included. 1 steam duster pad, 1 rectangle pad, and 1 XL rectangle pad. Durable and reusable. Steam activated micro-fiber cloth loosens, lifts and locks in dirt. Just toss it in the washer and use it again. Freshen and deodorize your carpets, while capturing surface dirt. Super-heated steam loosens dried spills and ground in dirt easily and sanitizes floors, killing harmful germs including e-coli. Pet and child friendly...no need to use harsh chemicals - just ordinary tap water. Washable micro-fiber pads lift and lock in dirt. No more messy mops and heavy buckets pushing dirt around. Steam dries quickly, leaving floors dry and clean immediately. 180 degree swivel steering insure ability to reach tight spaces. On all sealed hard floor surfaces especially wood floors. Natural mopping motion delivers super heated steam when you want it and where you need it...in just 30 seconds! According to the manufacturer Euro Pro, this item does not include the Triangle Head anymore. Why is the Steam Pocket Mop better than the original Steam Mop? - A unique 2-sided pad that allows you to clean dirt and grime with one side, and sanitizing and disinfecting with the other. - Multiple head attachments that allow for faster more effective cleaning: an XL head covers 50% more area than the original steam and a triangle head that fits easily into smaller areas and tight corners. - Includes a special steam duster pad for hardwood floors. - Upgraded design that improves floor surface contact, releases and captures more steam…leaving floors cleaner and drier. What type of floors can Steam Pocket be used on? The steam pocket can be used on all floors- except unsealed wood or unglazed ceramic floors. On surfaces that have been treated with wax or some no wax floors, the sheen may be removed by the heat of the steam action. We recommend testing an isolated area of the surface to clean before proceeding. -We recommend that you check the use and care instructions from the floor manufacturer. Is it OK to use tap water with my Shark Steam Mop? Yes, normal tap water is OK to use in all Shark Steam products. However, if you live in an area with hard water we recommend using distilled water to prolong the life of your product. Am I able to add any cleaning solutions to the water tank? We do not recommend adding any additional cleaning solutions to the unit. These chemicals could damage your Steam Pocket Mop or floors. It could also make your unit unsafe to operate. Most importantly, our Steam products make using expensive and toxic cleaners unnecessary. How can I produce more steam? The Steam Pocket Mop is designed so that you control the steam. The natural motion of mopping back and forth will produce steam. For best results, let your Steam Pocket Mop heat for 30 seconds before using after you first plug it in. Next, pump the handle 12-15 times to prime the pump. Then begin to clean your floor with a natural mopping motion. For larger messes, when more steam is needed, pump the handle up and down until the desired amount of steam has been released. If there is a difficult spot to clean, place the mop over the spot and pump the handle multiple times to release a large volume of steam. The steam will help release the stuck-on mess. When should I replace my Steam Pockets? We recommend that you purchase replacement Steam Pockets every 3 to 4 months. To maximize the life of your steam pockets please refer to “How Do I Care for my Steam Pocket”. How do I care for my Steam Pocket pads? Steam Pockets should be washed separately after every use, to avoid picking up lint. We recommend using only liquid detergents, as powder detergents can leave behind a residue on the microfiber. Do not use fabric softeners or bleach, as this could damage the microfiber material. To further prolong life, air dry your Steam Pockets rather than put them in the dryer. What should the carpet glider be used for? The carpet glider, in conjunction with your Steam Pocket Mop, is great for cleaning surface dirt, deodorizing and freshening carpets. However, it will not deep clean your carpets/area rugs. My Steam Pocket leaves a lot of water on the floor. What’s wrong? Check to see if your micro-fiber pads are too wet or dirty. If so, unplug the unit, remove the Steam Pocket pad and replace with a clean one. My floors are cloudy, streaky or spotty after steaming. What’s wrong? First check to see if the micro-fiber pad is dirty. If so, flip over to the other side or remove and replace with a clean one. If you are cleaning in a kitchen area there could be a build up of grease. Use a degreasing agent to clean the area first. Review care instructions. Using powder detergents, fabric softeners or dryer sheets can leave behind residue on the Steam Pockets which can transfer to the floor. You may have left the Steam Pocket Mop in the same spot with the Steam Pocket attached for too long. Never leave the Steam Pocket Mop in one spot with the Steam Pocket pad attached for an extended period of time. How do I fill the Shark Steam Pocket Mop? - Always unplug the Shark Steam Pocket Mop before filling the water tank. - Place the Shark Steam Pocket flat on the floor or counter top. - Remove the water tank cap by turning it counter clockwise . - Fill the filling flask with water. - Slowly pour the water from the filling flask into the water tank. - Continue to fill the flask with water and slowly pour into the tank until the water level reaches the tank opening. How do I install/remove the mop heads? - Always unplug the Shark Steam Pocket Mop before changing the mop head. - Lay the Steam Pocket Mop on the floor, countertop or table. - Grip the mop head with one hand and depress the grey button near the base of the unit with the other hand’s thumb. - While firmly pressing the button, pull the head away from the unit. - The head should release from the unit. - Select the desired mop head. - Locate the rectangular hole on the mop head plug. - Push the mop head onto the unit until a soft click is heard. This means that the mop head has been locked into place. How do I attach the Steam Pocket? - Select the desired mop head and steam pocket. Please note that it is easiest to install the Steam Pocket onto the head after it is removed from the Steam Pocket Mop. - Place one side of the mop head into the side of the steam pocket that does not have the lavender loop. - Grab the lavender loop on the other side of the Steam Pocket with your finger and gently pull it onto the other side of the mop head. o NOTE: To make it easier, ensure that the bottom corner of the first side you installed is fit tightly against the corner of the mop head. - Finally, secure the hook and loop fasteners. You are now ready to use the Steam Pocket Mop. How do I attach/use the carpet glider? The carpet glider is meant for use with only the All-Purpose Mop Head. - Install the All-Purpose Mop Head onto the Steam Pocket Mop. If you need help with this please refer to “How do I install/remove the mop heads?” for details. - Place the carpet glider on the ground with the flat side facing the carpet with the curved edge facing you. - Place the All-Purpose Mop Head into the carpet glider. Please note that the carpet glider is designed to be easy to install so there are no clips or snaps. The All-Purpose head simply sits in the glider during use. How can I make it easier to push the Steam mop? - Try adjusting the telescopic handle to better fit your height. The taller you are, the longer you want the handle to be and the inverse if you are shorter. Do this by lifting the grey latch that is in the middle of the handle. Then adjust the handle up or down to the desired height. Once it is at a good height for you close the latch. - Alternate the sides of the Steam Pocket more frequently. You will find that if you use one side of the Steam Pocket for a extended amount of time, once you flip it over to use the other side it will be easier to push. - Check to see if your Steam Pocket is excessively dirty. If so, change to a clean Steam Pocket and wash the dirty Steam Pocket. - Check to see if the pocket is excessively dry, if so pump the steam mop in a up and down motion to release more steam. It is generally easier to push the mop if there is more steam. - Make sure the steam pocket is attached correctly. If you need help with this please refer to “How do I attach the Steam Pocket?” for details. - The Shark logo should illuminate blue if it is powered on. If you are having problems with the unit not steaming, please refer to “My Steam Pocket Mop is not producing steam”. - Make sure that the Steam Pocket Mop is plugged into 120 VAC electrical outlet only. - Check your home’s circuit breaker or fuse box for any blown fuses or tripped breakers. 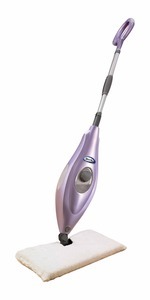 The Steam Pocket Mop requires 13 amps to operate. My Shark Steam Pocket Mop is not producing steam? - Make sure that there is water in the water tank. - Also check to see if the unit is plugged into a 120 VAC wall outlet and the Shark logo is illuminated blue. - Once the Steam Pocket Mop is plugged in, let it heat for 30 seconds and then pump the handle in a up and down motion 12-15 times in order to prime the pump. This should produce steam. o Steam Pockets should be washed after every use. o You should wash your Steam Pockets separately from other fabrics to avoid picking up lint. o We recommend only using liquid detergent as powder detergents can leave behind a residue on the microfiber. o Do not use any fabric softeners or bleach when cleaning the Steam Pockets, as this could damage the microfiber material. o In order to prolong the life of your Steam Pockets we recommend that you air dry them. o We recommend that your Steam Pockets should be replaced every three to four months.